Despite being named after a flower and her entire family being in the floral business, these colourful and fragrant parts of plants are Poppy's worst nightmare. So when after her grandmother's passing she unexpectedly inherits the old flower shop in the seaside town of St Felix she is fully prepared to waltz in there to take stock and sell the place to the first person who offers a decent price for it. From past experience Poppy knows that she's not cut out for sticking with a job for a long period of time anyway, so she might as well cash in when she has the chance. What she isn't prepared for is the flood of happy memories that engulf her as soon as she revisits St Felix, the town where she spent many a carefree summer holiday with her brother when they were still kids. The high-street looks a little more run down than she remembers it to be and she doubts that Mad Stan the Pasty Man still lives up in Trecarlan Castle, but other than that little has changed from when she last set foot in the place when she was a teenager. However, after a chance encounter with a monkey by the name of Miley, and her very handsome owner, Poppy suddenly finds herself willing to try to return The Daisy Chain shop to its former glory. And despite her peculiar reservations about flowers, and a big secret she is hiding from the townspeople and her new friends, the incredibly welcoming community on the Cornish coast might just be what Poppy needs to finally be able to work through her issues and find happiness again. This novel is SO good you guys! I loved Ali McNamara's previous books, especially the fun and imaginative Step Back in Time, but The Little Flower Shop by the Sea is on a whole new level of awesome. The charm of the seaside town just pops of the pages and the cosy atmosphere was amplified by the incredible cast of heartwarming characters that live and work in St Felix; from baking duo Ant & Dec to cheeky monkey Miley, and from the gentle Amber who carries her own secrets around to the incredibly handsome Jake and his amazing children. I am actually quite gutted that St Felix is a fictional setting as otherwise I would seriously contemplate moving there myself. It's rare to find that real feel of a community in today's day and age and Ali has captured this longing for simpler times and a neighbourly kindredness beautifully on the pages of her book. Poppy may have been broken when she arrived, but the town and its inhabitants have a healing effect on her as she blossoms into someone who really fits into the community at St Felix. I feel like I'm not doing the novel justice at all, talking about how sweet and cute it is, when in actual fact it is far more complex and well written than that. There were moments I cracked up laughing (they mostly involved Miley) and others where my heart broke for the characters as many of them, in particular Poppy, Jake and Amber, had far too much hardship to endure for one lifetime. And then there were times I felt an intense anger bubble up inside of me and they, unsurprisingly, all involved the horrible Caroline. 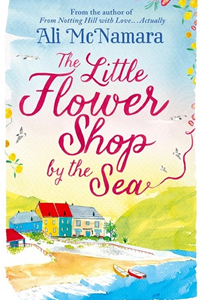 The Little Flower Shop by the Sea is just sheer summer-read perfection all around; it will make you laugh, it will make you cry and it will make you want to reread all of Ali McNamara's previous books. Heartwarming, charming and utterly delightful from start to finish, this is her best novel yet!